As the economy of Hong Kong is undergoing a structural change and is facing strong competition from other countries, local organizations must build up more strengths to deal with these challenges. Therefore, the Association specially designed this programme to provide managers and officers those essential knowledge and skills which will enable them to support a productive workforce and provide good service to both external and internal customers. This programme can be completed in 1 year. It consists of seven modules, with a diploma being awarded upon successful completion of the course. 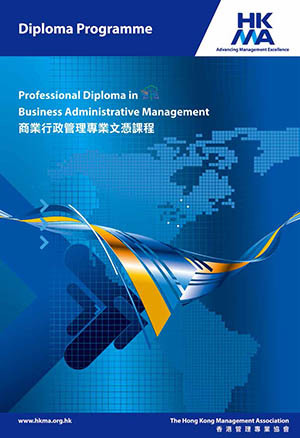 "Business Administative Management", "English for Business Communication"